The rolling gallery at TABSA, where 48 pairs of rollers craft a variety of cigars. I was up early, standing on the balcony at the Hotel Don Vito, smoking a cigar and drinking a a cup of black coffee. The rising sun was already pummeling the humidity-drenched streets of Estelí and I could feel the weight in the air—like a curtain hanging over everything, slowly lifting, evaporating. I made a phone call and found a ride to TABSA (Tabacos Valle de Jalapa S.A.), a cigar factory in Estelí. 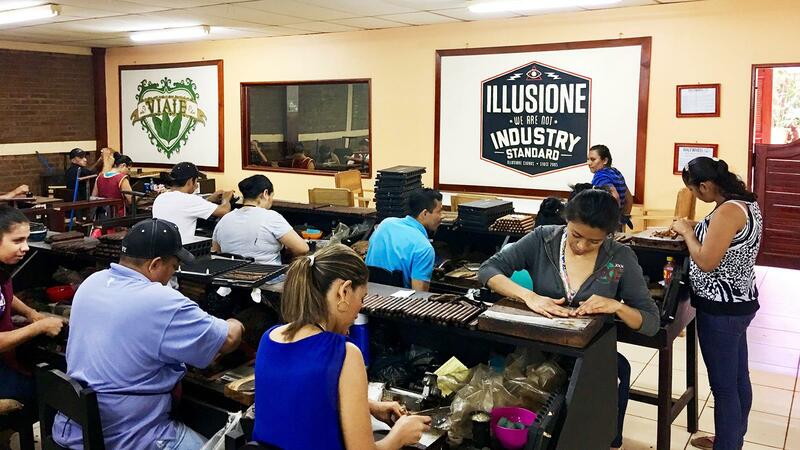 TABSA is owned by Eduardo Fernández—who makes some of his Casa Fernandez cigars there—but the factory also makes cigars for Illusione, Viaje, Warped Cigars, HVC Cigar Co. and Foundation Cigar Co. The front door swung open and I was met by Terence Reilly, senior vice president of sales and marketing for Casa Fernandez, and Reinier Lorenzo, brand owner of HVC. They took me inside. “Have you ever smoked a cigar fresh off the rolling table?” Reilly asked me. We were standing in the middle of the rolling gallery. A busy hum of hands as 48 pairs of rollers worked around us, crafting cigars. He handed me a slim, unbanded cigar with a closed foot. A torcedor had put it together only a moment before. I turned the cigar in my hand, rolling it between my thumb, index and middle finger. It glistened in the light. It was a Guardian of the Farm Apollo Selección de Warped, Cigar Aficionado’s No. 8 cigar of 2017. I lit it up. There’s something special about smoking a cigar that’s been brought to life just before your eyes. And this particular cigar, blended by Max Fernandez of Casa Fernandez and Kyle Gellis of Warped Cigars, was a Nicaraguan puro, rolled only with Nicaraguan tobaccos. It felt right, smoking it there on a fine morning in Nicaragua. Reilly and Lorenzo took me through the factory. Into the aging room with its shelves stacked high with resting cigars. Into a back room where workers applied bands to the cigars and packaged them in boxes. Then into a huge room where pilónes dominated the floor—massive piles of tobacco fermenting under the weight and pressure of leaves stacked on top of each other. Lorenzo showed me how I could put my hand inside the pilón and feel its warmth, the heat from the fermentation, like something alive. We ended up in a large storage room where giant bales of tobacco sat. On top of one of the bales, Reilly and Lorenzo had set up a surprise: four trays of tobacco, each containing a specific leaf varietal. Each leaf was rolled into its own short, little cigar, a ‘“purito” as they’re sometimes called. An assortment of puritos that comprised the component tasting. 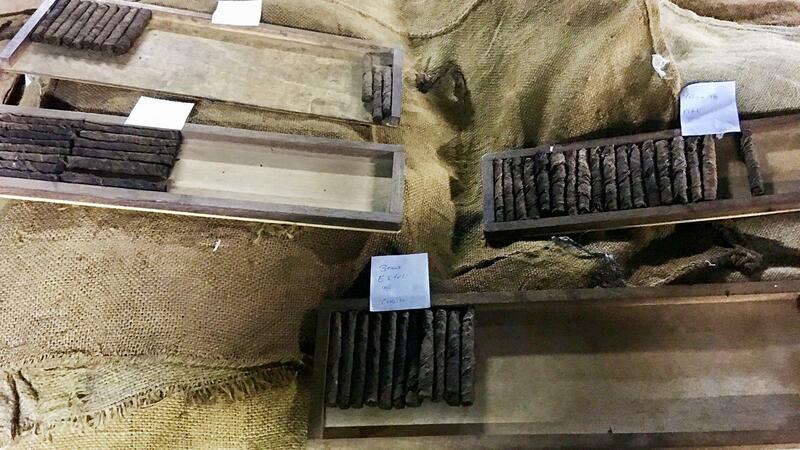 They had laid out little smokes of Corojo '99 in two types of primings, from two different regions of the country. There were viso and seco varieties from Jalapa, and viso and secos from Estelí. Seco is the mildest type of tobacco, viso is in the middle of strength. Ligero tobacco, which is the strongest variety, was not included in the tasting. All the tobaccos were cultivated from Aganorsa farmland (Aganorsa is a Nicaraguan farming operation owned by Eduardo Fernández). We started smoking through the puritos and the first thing I noticed was the variation in flavor and power based on the different seed varietals and the location where the tobacco was grown. The Criollo ‘98 from Estelí had more strength and minerality than the Corojo ‘99 from Jalapa, which was more elegant and sweet with a pleasing aroma. “The Criollo ‘98 from Estelí is stronger and spicier with more body and the Corojo ‘99 from Jalapa is sweeter, with strength as well, but it's more subtle and it builds,” Reilly said. We finished up the tasting and met up with Eduardo Fernández, who took us into his conference room for a chat and an espresso. It was almost time to go. But there was one last thing I wanted to see. “Can I see one of the Guardians?” I asked him. He took me back outside into the hot, Estelí sun. He called to Campeon, one of the American bulldogs that protect the Aganorsa farms and TABSA factory. Along with her fellow noble beasts, she is the inspiration for the name of the cigar brand Guardian of the Farm. What she was guarding at this particular moment I can’t be sure, because she was sleeping lazily in the shade of the factory. Fernández called to her again. She perked up off the cool concrete and trotted out to us, her tail wagging. I pet her white speckled fur. “I know, Campeon. It’s pretty hot out. You’re a very good dog,” I told her. She wagged her tail. I think she understood. My tour of the TABSA factory was complete.